Lee & Marie Knight and our two young sons Freddie and Arthur welcome you to the White Hart, Blythburgh. Formerly of the Queens Head, Blyford for three years, Lee & Marie gained an excellent reputation for good food and hospitality and consequently were awarded with accolades to support this; ‘Adnams Best Newcomers’ and a Trip Advisor certificate of excellence (May 2013) for consistently good comments and recommendations. 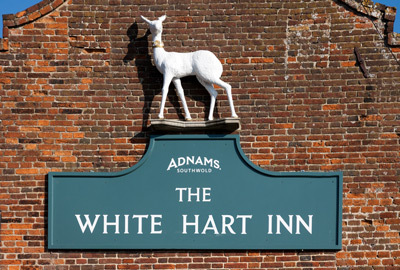 We endeavor to continue this success at the White Hart. 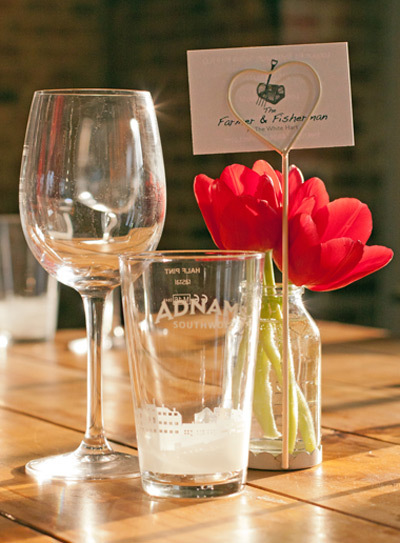 We aim to provide a relaxed atmosphere for all to enjoy, serving fabulous Adnams Ales and a varied food menu. With two young children ourselves we are very aware of family dinning needs and offer a ‘Juniors’ menu to tantalise young taste buds with childrens cocktails (non-alcoholic, of course! ), healthier options as well as classic offerings and sweet, naughty puds, including sticky toffee pudding and a chocolate sundae to mention a couple. A large number of meals from our main menu can also be offered as half portions. Our menu concept focuses on steaks and seafood but really offers something for everyone with pub classics as well as restaurant dishes with a more modern outlook. We strive to use as much locally sourced, seasonal ingredients as possible, which can be enjoyed in the bar and in The Farmer & Fisherman restaurant. The thought process behind the naming of ‘The Farmer & Fisherman’ is to offer the best quality the land and sea gives us in such a rich food providing county. We are a very ‘hands on’ couple who both have various degrees of knowledge in different aspects of running a public house successfully and we utilise these skills to provide a strong professional and dedicated husband/wife team. Lee is the head chef/Landlord who started his working life as a fisherman, so has extensive knowledge of fish species, sustainability of the species and the culinary skills to blend flavours. He has worked for many years as a professional chef and for Adnams hotels as a head chef. Marie, although a nurse by profession is very passionate about the business she runs and manages all areas of the establishment. Although we are a large establishment we always advise to book so that you will not be disappointed. Any specific dining needs can usually be met with sufficient information and notice, be they decorations on tables for celebration or for example, dietary needs, so please do not hesitate to inquire. We are both extremely passionate about the service we offer to you, the beautiful heritage coast surrounding us and the people, both local and visiting, old and new, and sincerely hope this conveys to all, and that you thoroughly enjoy your experience with us.